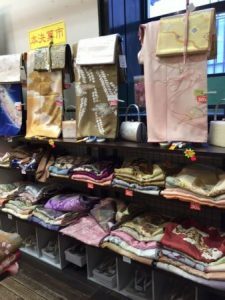 Where to buy Kimono for the souvenir in Kyoto? 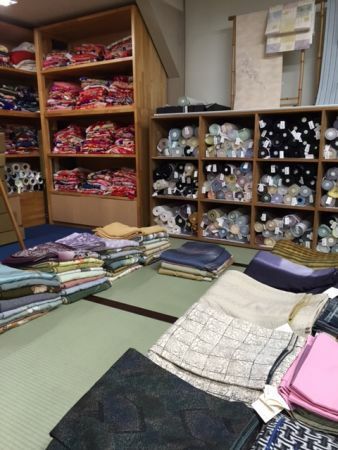 Where to but affordable kimono for souvenir in Kyoto? 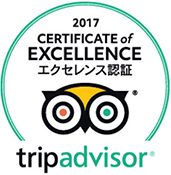 Daiyasu is just 2 minutes’ walk from Shijo Horikawa. It’s easy to find on Shijo Street and the price is also friendly. 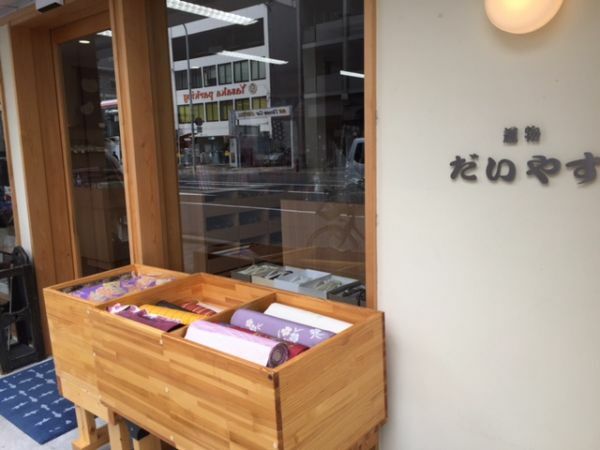 I’ve heard from the manager that many foreign tourists are visiting to buy Kimono lately. Not only adults’ kimono, but also they have some small size kimono for children because we Japanese have the events to celebrate the growth of the children of 1month, 3, 5, and 7 years old. 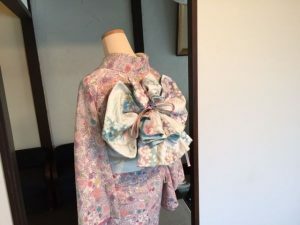 If it’s only for the display in your house, of course you don’t need anything except kimono, but actually we need some other items to wear it. We also be able to buy detail belongings for wearing kimono such as Obiage (the bustle of obi sash), the rope to tie obi, Tabi (white socks for kimono) etc here. But if you would like to learn how to wear kimono, I recommend you to start from yukata, which is the casual wear for summer. We don’t need more belongings than kimono. Casually, yukata, 2-3 ropes, and half width obi (sash) are enough. ichi-man-ben is in the retrospective building on Sanjo Street. It had been the insurance office around 1912-1926, so not traditional Japanese house, but very different from the new building nowadays. It is registered as the cultural property in Japan. 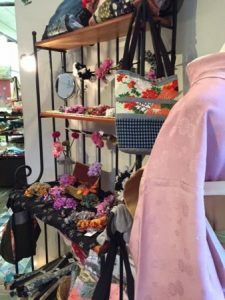 We can find many kinds of kimono from casual ones to formal ones here. 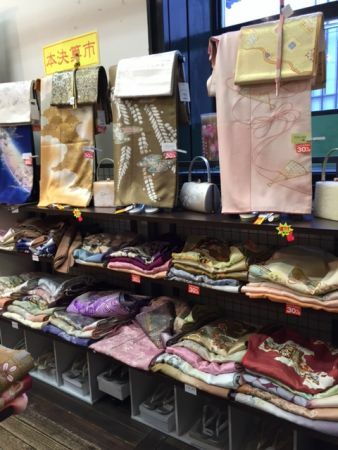 Also there are some washable kimonos for the beginners, which are really friendly price about 10000yen. The hair accessories with Japanese patterns were also pretty. Kimono campaign is held in Kyoto from March 19th to 21st 2016 in Kyoto. We call these 3days “the day of traditional industry”. If you wear kimono, you can get on the city bus or subway in free in Kyoto. But don’t forget to bring this ticket! You can get the ticket in the bus back of the driver or subway stations. In addition, entrance fee of some museums like The Museum of Kyoto near ichi-man- ben (only the permanent exhibition area) or “Eki” on the 7th floor in JR Isetan department store are also free these days if you wear kimono. 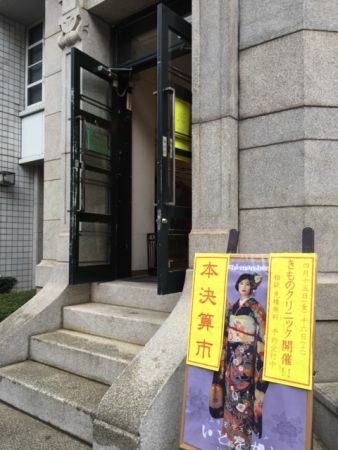 A lot of women wearing kimono were visiting museums when I joined this event with my friend few years ago. Kyoto city will be more beautiful than usual! This traditional industry event is held every year around March 20th recent 10 years in Kyoto. How about joining this event and enjoy kimono?